Home > Blog > The Smith family tell us why they hired a motorhome, then bought it! 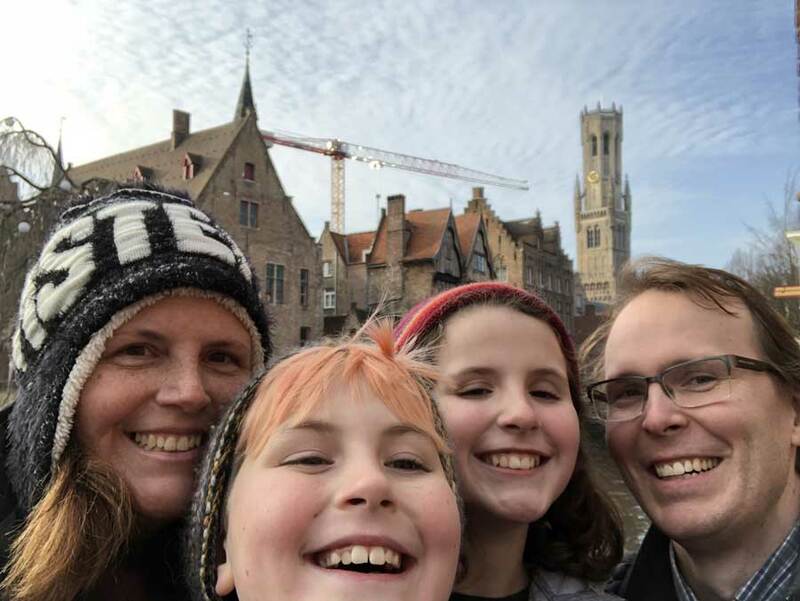 The Smith family recently hired a Euro Voyager Motorhome and toured parts of Europe over the 2017/2018 winter months. They were having so much fun, they decided to buy the vehicle and continue their tour! On calling into the depot I sat down with them for a quick chat. Many people are put off by a winter motorhome trip, how did you find it? We were keen to spend Christmas in Germany because of our family links. A seasonal trip taking in all the Christmas markets and events was really enjoyable. Driving was very straightforward although we had to be careful with the shorter days and tried to minimize traveling at night. The motorhome was warm and cosy with plenty of space after a day out. A big plus was that everywhere was a lot less crowded, there was little queuing to see the Mona Lisa at the Louvre for example. There were plenty of spaces at the campsites and there was no need to pre-book. This meant our plans were much more flexible. We could tell they were set up for much bigger numbers in the peak season. Any negatives of a winter trip? France Motorhome Hire gave us two extra propane tanks for the winter season. As you would expect, you burn though more propane in the winter months. It meant we had to stop and resupply fairly often. Any tips for anyone wanting to try a low season motorhome trip? Being on such a long trip, some other campers advised we purchase external insulation covers for the windows. It helped us save a little on propane for the heating. We also downloaded the app Camper Contact which we found very useful to find campsites across Europe. 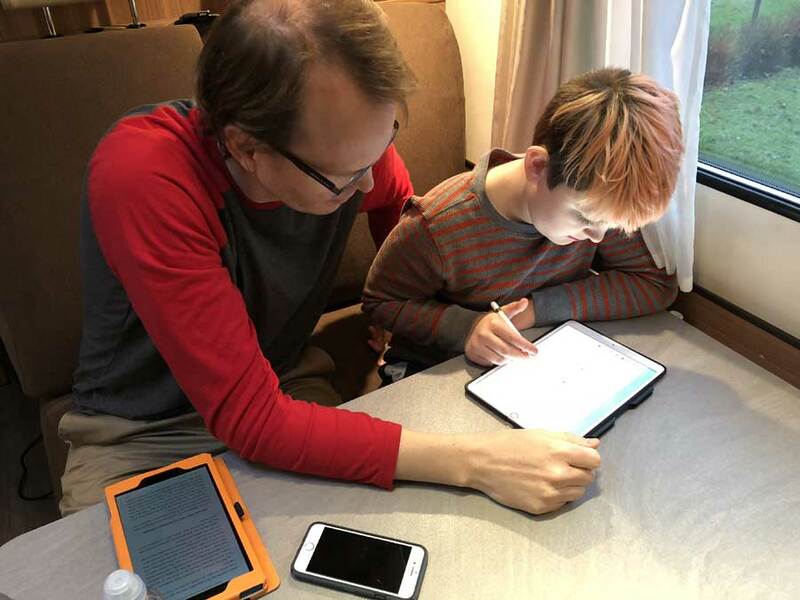 How did you find the trip as a family of 4? A big difference for us was cooking. On a previous trip we used AirBnB’s but it meant you had to resupply on food at each stop. With a motorhome, we could buy all the cooking staples and reuse them over the trip. We found hiring a motorhome was actually the cheapest way overall for our trip. The flexibility was also a big plus. There was no checking in our out, leaving luggage, making connections or waiting around. We could extend or shorten our stay in each location to our liking. On our travels we happened to see the Playmobil funpark (which the children forced us to stop off at!) so just called in and stayed the night. What made you decide to hire from France Motorhome Hire? The customer service was great. We had a few questions and details to organise for our trip which were quickly dealt with. This gave us confidence that we would not be alone on the trip if we had any issues. Not knowing exactly what we may or may not need on a motorhome trip, the all inclusive deal you offer reassured us we would have all the essentials when we set off. We did search online for multiple motorhome hire companies but they either didn’t speak English or failed to return our emails. What made you decide to buy during the hire? We decided early on that we wanted to extend our trip and buying a motorhome worked out the cheapest way of doing it. We valued the flexibility a motorhome gives you and didn’t want to give this up. We had heard of other options like “buy back” but they felt like schemes to us. The France Motorhome / Euro Camping Cars method of registering a vehicle in our own name, fully and officially, was just what we wanted. Compared to a motorhome trip in the USA where we are from originally, a trip in Europe is much more cost effective. Sure the gas is expensive but the vehicle is more economical and the roads were easy to navigate. Vehicle depreciation is also a lot less in Europe if you are buying. Many people told us a long winter motorhome trip would never work, but we would recommend it! For more information on whether to hire or buy or both, visit our long duration trips advice page or our vehicle sales website.